Villa in Chianti for 10 +2 persons. The villa has been recently renovated and situated near Castelfiorentino among the Florentine hills, surrounded by an enchanting landscape of the Chianti region. The villa consists of living room with fireplace, kitchen, 5 bedrooms, one on the ground floor, 3 bathrooms, private garden with swimming pool, barbecue and external hedge. The villa offers views of the Tuscany and Chianti landscape. The property is accessed via a dirt road in good condition. 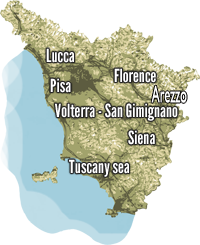 Castelfiorentino with all kinds of shops is located 3 km, Montespertoli 10 km, Florence approx. 35 km, Siena approx. 50 km. At guests’ disposal: large garden with tables and chairs, swimming pool and barbecue facilities. Parking within the grounds. Upon booking you can have breakfast, dinner, Tuscany. Dinner is served in the villa and menus can be arranged. Possibility of cooking courses organized at the villa. The villa is the ideal place for visiting Florence and Tuscany staying in an oasis of peace in the Florentine countryside.